The NESN reported Monday morning that Andre Johnson’s former self-representation with uncle Andre Melton ended up costing him $20.0 million. Last month Johnson switched some roles between Melton, his former agent, and his current negotiations agent Kennard McGuire. The report is assuming that Johnson would not have extended his rookie contract in 2007. Johnson signed a six-year, $39.0 million rookie contract in 2003. In 2007, he extended the contract six years totaling $81.71 million earned between the two contracts by 2014. 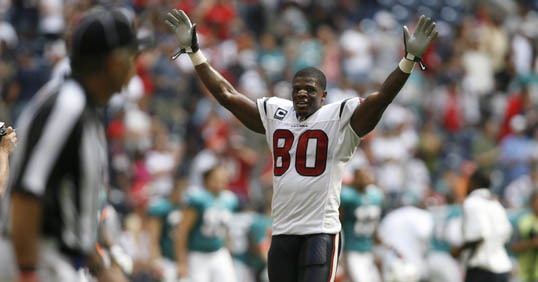 The NESN report wrote that Johnson could have earned $20.0 million more by letting the rookie contract expire (and undoubtedly stir free agency dilemma between the Texans, Johnson and the NFL) in 2007 and pushing for a more lucrative new deal from the Texans rather than signing the rookie contract extension. Hindsight is always 20/20.